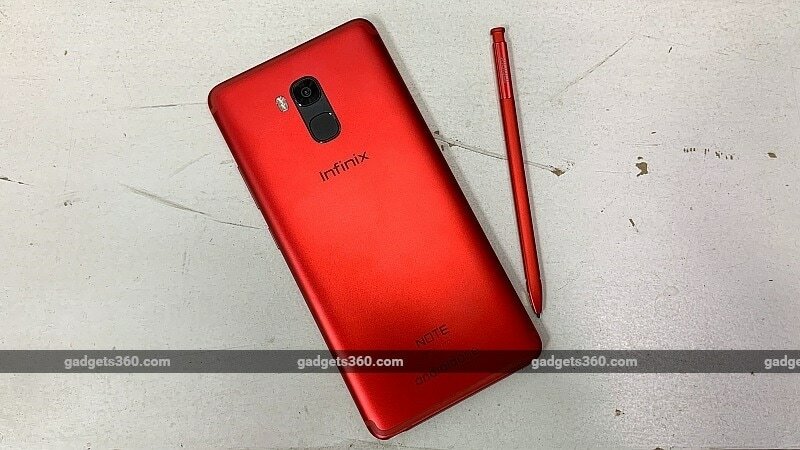 Infinix Note 5 Stylus was launched in India on Monday, at an event in New Delhi. The smartphone is essentially a variant of the Infinix Note 5, with minor differences on the specifications front, as well as support for a stylus called XPen. Highlights include it being part of the Android One programme, which promises timely updates as well as an optimised stock Android experience, apart from a 4,000mAh battery with fast charging, an 18:9 display, a pair of 16-megapixel cameras, and a full metal body. The Infinix Note 5 Stylus price in India is set at Rs. 15,999, and it will go on sale from December 4 exclusively via Flipkart. It will be made available in Bordeaux Red and Charcoal Blue colour variants. The dual-SIM (Nano), dual 4G VoLTE Infinix Note 5 Stylus runs Android 8.1 Oreo, and is part of the Android One programme. The smartphone bears a 5.93-inch full-HD+ (1080x2160 pixels) LCD display with a peak brightness of 500 nits, support for 85 percent NTSC colour gamut, and a pixel density of 407ppi. It is powered by an octa-core MediaTek Helio P23 SoC, clocked up to 2GHz, coupled with 4GB of RAM. The Infinix Note 5 Stylus features a 16-megapixel rear camera with an f/1.8 aperture, dual LED flash, and HDR support. The company is touting the presence of AI features like AI Auto Scene Detection, AI Portrait, and Beauty modes. On the front, the Infinix Note 5 Stylus carries a 16-megapixel camera with an f/2.0 aperture, 4-in-1 Big Pixel tech, and softlight flash, as well as AI modes like AI Bokeh and AI Beauty. There is 64GB of inbuilt storage on the Infinix Note 5 Stylus, expandable via microSD card in a hybrid dual-SIM configuration. Connectivity options include 4G VoLTE, Wi-Fi, Bluetooth v4.2, FM radio, a 3.5mm headphone jack, and Micro-USB with OTG functionality. Sensors on board the Infinix Note 5 Stylus include an accelerometer, ambient light sensor, digital compass, gyroscope, and a proximity sensor. A fingerprint sensor is placed on the rear panel. It runs on a 4,000mAh battery and comes with an 18W fast charger. As for the XPen stylus that ships with the Infinix Note 5 Stylus, the company is touting features such as screenshots, Air Command, Memo, as well as drawing.